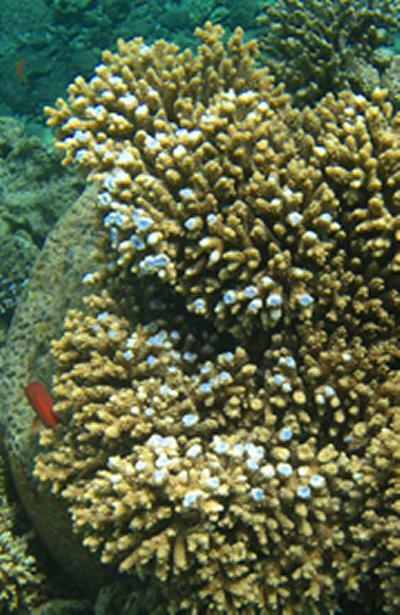 Research from the University of Southampton and National Oceanography Centre , Southampton has provided new insight into the basic immune response and repair mechanisms of corals to disease and changing environmental conditions. The study, published in the latest issue of the journal Coral Reefs, found that increased growth is the underlying physiological process associated with disease, wounding and stress-related colour changes in reef-building corals. The study investigated distinct green fluorescent protein (GFP)-like pigments responsible for the green, red and purple-blue colours of many reef-building corals. By examining these GFP-like pigments in four coral species from the Red Sea, the Arabian/Persian Gulf and Fiji, researchers found that their presence indicates growing tissue in growing branch tips and margins of healthy coral colonies; as well as in disturbed colony parts, compared to undisturbed areas. Dr Joerg Wiedenmann, Senior Lecturer of Biological Oceanography and Head of the Coral Reef Laboratory at the University of Southampton, who led the study, says: “The specific pigment signatures that we observed, demonstrate that locally accelerated growth in the presence of foreign biological material, represents a novel component of the innate immune response of reef corals in which the animals try to neutralise potentially dangerous organisms by overgrowing them. The researchers were able to detect coral growth and tissue proliferation by using the excellent biomarker properties of GFP-like pigments. Fluorescent proteins from reef corals are routinely applied as markers in biomedical and pharmaceutical research, because their fluorescence can be easily detected. Dr Wiedenmann, who is based at National Oceanography Centre, Southampton, adds: “The future of coral reefs is strongly dependent on management strategies that can promote their recovery and resilience. The success of these efforts will rely on the identification of particularly vulnerable areas or regions affected by high levels of stress. “Coral reef monitoring will benefit from this study as the use of these GFP-like pigments as biomarkers can be used as indicators of mechanical stress/damage inflicted, for instance, by swimmers or divers or give an indication of parasites or disease.